About : There comes a time in life when we find ourselves in the desert place of burning questions. Why? Why me? But even as we shake our fist heavenward, the heart whispers another question. Who? Who are you, God? It is a question of relationship, a question we all murmur in the hardest places. "Under a Desert Sky" is a book that every single one of us needs to read. At some point in our lives, we will each face a situation where life is hard. Lynne takes something so difficult that she faces in her life and brings such powerful words and life to this amazing book she has written. She has woven a beautiful tapestry of words and an amazing picture of the cancer journey she has been on, even though it has been nothing shy of amazing. The emotion and heart she brings the reader one that is of brilliance and cannot be missed. This is one of. those non-fiction books that you simply cannot put down because you see your story within hers even if you have never faced cancer. I LOVED this book and I highly recommend it. I give this book 5/5 stars. I was given a copy by the publishers and a favorable review was not required. 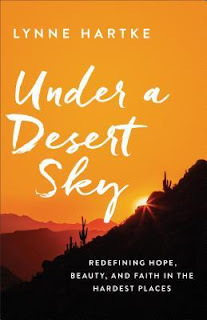 Lynne Hartke celebrates the difficult and the beautiful with her husband, Kevin, in Chandler, Arizona where they have pastored a church for over thirty years. 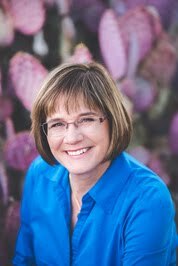 When not on the trails avoiding rattlesnakes, Lynne is blogging, volunteering for the American Cancer Society and Relay for Life, and keeping up with their four grown children and three grandchildren. Lynne and her husband are currently planning their next desert adventure that will require plenty of water, a topographical map, and substantial food, because Lynne is tired of eating granola bars.